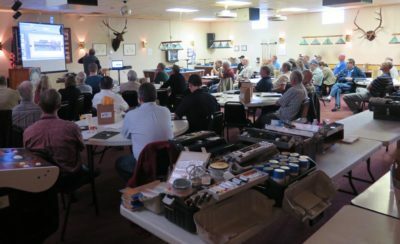 I just got back home from yet another immensely successful Groopshop, this one in Madison TN, hosted superbly by Mark Faulkner of Besway, long time supporter of Groop individually and in the aggregate, and organized by Mike Mascelli with his usual aplomb and attention to details necessary to make everything run flawlessly. BRAVO all! 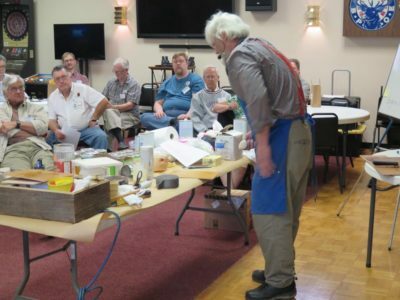 The first day’s program began with a summary of a mind-blowing project by Al Lopez, who walked us through the restoration of a large chapel at Duke University. The level of complexity for both the technical aspects and the logistics of this high-wire project (almost literally as it was up in the beams and rafters of the chapel) were simultaneously sobering and thrilling. One of the special aspects of the presentation was that Al brought his entire crew with him to Groopshop, and except for Prof. Dr. Mrs. Lopez they were all new to Groop and if the visuals were any indication, they had a blast. 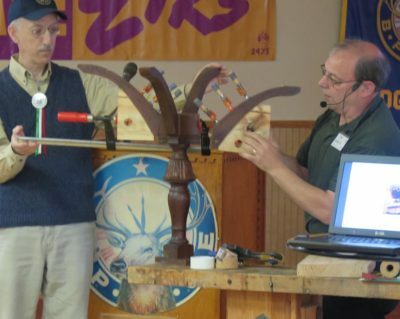 DelVe triangle square inventor and furniture restorer Tom Delvecchio followed that up with a demonstration of his solution for a problem vexing to all of us, the clamping of irregular and curved shapes for gluing. Tom has created an entire set of custom cauls for such work, and with the assistance of The Mikestro walked us through the entire process. I always love situations where there is a creative and ingenious low-tech solution for a seemingly intractable problem. 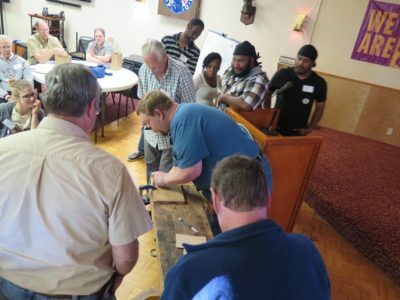 After lunch we had Michael Lehikoinen showing us his well-honed methods for making veneer repairs, always a hot topic at Groop. Michael is relatively new to Groop, and wins the award for being the only the Foreign Traveler. Michael is a terrific addition to the family, and blended well with other Groopsters old and new. I look forward to further interactions with him, and wonder how well he made it home with his car full of booty from the auction. I spent a while setting up then walking the attendees through the theory and process of making custom blended paste wax. We added another recipe to the twelve I had in hand based on the work I’d done previously. I was very pleased with the performance of the new blend. I will be posting my handout to the crowd once I get done revising it to reflect the session. Following dinner we were treated to Jerome Bias’ impassioned exposition on the amazing historical figure of Thomas Day, a free-man of color who became the largest furniture manufacturer in the state (producing up to 20% of the total furniture output in the state). Jerome has been on the trek to understand more fully this titan of the past. And thus endeth Day One.